Last night and this morning we had the worst storm the South East of England has seen in several years, and although we came through completely unscathed our thoughts are with all those who suffered damage to property, homes, travel misery and worse. 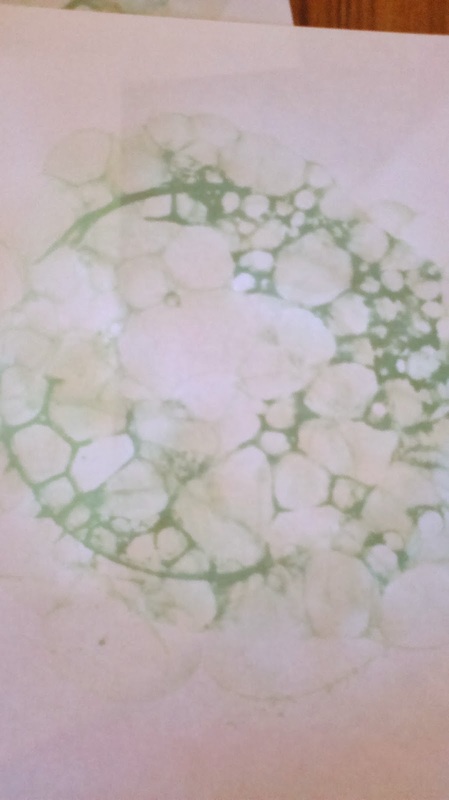 Most of today wasn't more than 'seasonally blustery' (weatherman speak for 'hang on to your children or they'll get blown in to a bush') but, since littlest is producing volumes of snot usually only witnessed in nature by someone annoying a hagfish, I thought indoor activities would be sensible today. Big brother Ollie has been well and truly bitten by the Halloween bug after going to our friend's Halloween party on Saturday, so he was really keen to dress up our house to be as 'spooky amazing' as their house was. I don't think we're quite up to our friend's creative flair, but here's what we got up to today. None of it is particularly original, but that's the great thing about having kids - they neither know nor care if something has been done a hundred times before. For littlies they rather like it if they themselves have done it a hundred times before since they crave repetition in all sorts of things, including play. 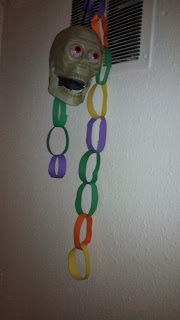 The first thing we made were paper chains to add to our skull as part of a 'dungeon'. This seems really simple, but actually is really useful for children Ollie's age (nearly 4) as it gets them used to using scissors, at first with help and then by themselves. I found the best place to start this skill off was with plastic scissors and play dough at 18 months or so. Don't push too much at first for them to hold the scissors as an adult would, they don't necessarily have the reach or strength to cut anything as an adult would, but will get by fine for several months using two hands to manipulate the scissors to chop in to balls of dough or cut up dough sausages. Once they're getting more confident and their hands are big enough, you can show them how to hold the scissors properly, but don't get frustrated if they don't go for it - they'll get there in their own time so long as you keep modelling what you want them to do by letting them see you cutting dough using the scissors. Paper chains were also good because we could all get involved and 'work as a team like Cranky in Thomas' as Ollie put it, with one of the boys choosing the next colour and the other adding glue, with lots of turn taking and sticking things to themselves, each other, but mainly to me. I found a green coloured glue stick and I find this really useful because the boys can see where they've put their glue. Next up we made a cobweb. Toby and I held the wool at either end while Ollie cut in between until we had a few lengths of wool. I then tied some together to make a basic shape and Ollie threaded longer bits through to fill in the middle. 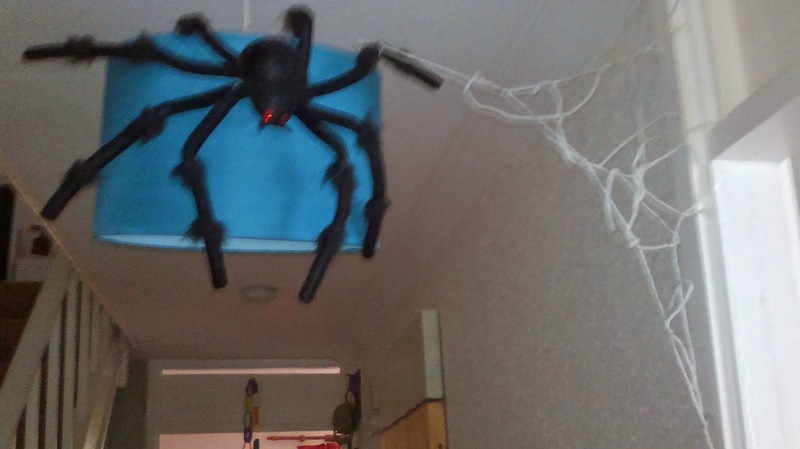 We added the web to the spider in our hall. As before, the useful skills here are dexterity and safety in using scissors 'scissors are sharp, everybody knows, point them down to your toes' as they say on the kids cooking show on CBeebies. 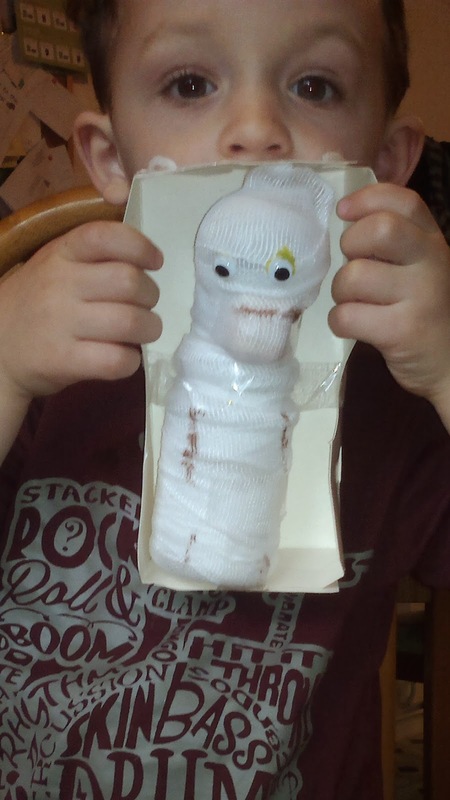 Ollie asked to wrap up a mummy, so I taped a half a helmet from one of his Octonauts toys to a small empty drinks bottle, wrapped it up in a cheap finger bandage from the first aid kit, taped it into an empty cardboard box and then added googly eyes and a drawn on mouth. 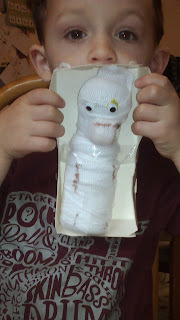 I taped some wool to the top of the box and our mummy is now hanging in the kitchen window, along with a ghost we made from a craft set on a kids magazine that I had saved from last year when Ollie was a bit to small to manage it. I know that hoarding too much stuff can get to be a clutter problem, but a couple of boxes of things saved from the recycling bin makes life a lot easier when the littlies decide they must build a rocket right now. I had saved a couple of fruit nets to use to make things such as pretend rock pooling fishing gear, goals for finger football or a fishing net for an underwater picture, but we decided that this one would make a good spider web picture. 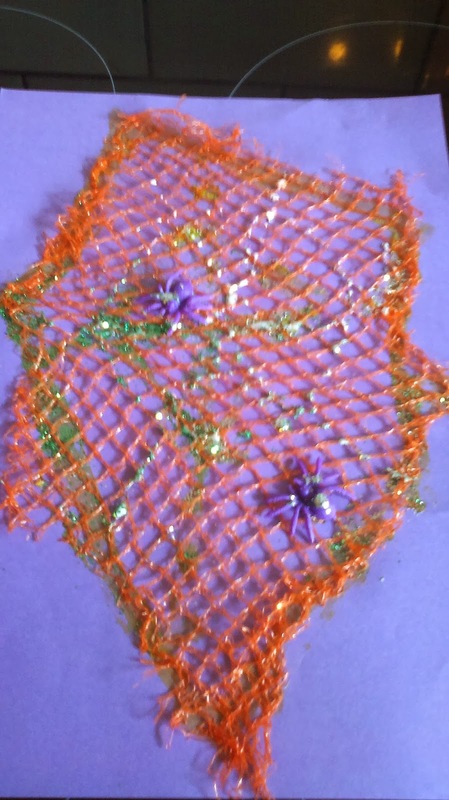 The plastic spiders were also left overs saved from a kit on a kids magazine last year and we added glue and glitter to make web shapes. Glitter shakers are one of Toby's favourite things and I'm so happy I found some in a sale this year with proper shaker caps. The tubes we had been using were a pain as the tops were so hard to get off the glitter would fly everywhere when the cap finally did give way. Ollie got to use his beloved scissors again and we all put on glue and glitter. 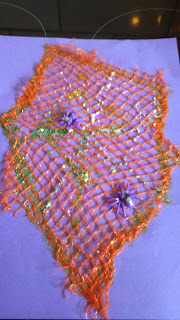 We used glue stick to attach the net to the paper, then PVA glue to make the web shape and stick on the spiders. Our last make was soap bubble monster pictures. A good squeeze of washing up liquid, a splash of water, a straw, some paper and some pens is all that's needed for this one. 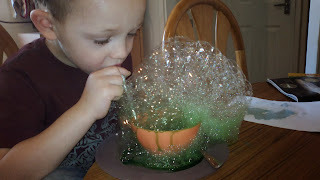 I think Ollie would have been happy just blowing bubbles all day, without the added extra of using them for printing. to rely on your own judgement about what your child is ready for for this one. 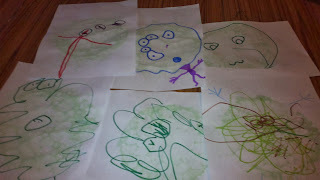 When the pictures were dry, and Toby was awake, Ollie followed the shapes to make eyes for his monsters, which is good writing practice. Toby was very keen on selecting the colours he was going to use, which was great as I could name the colours he chose and sign them in Makaton at the same time, helping his speech acquisition and encouraging him to say 'yes' and 'no' when I offered him other colours. These activities kept us busy on and off all day, with breaks for food, and in Toby's case a very snuffly nap. The house is now nice and spooky, and with the exception of the skull and spider (which cost £2 for both) and a few sheets of coloured paper it hasn't cost us anything. We still have a couple of days to get busy if anyone has any ideas for cheap/free Halloween makes or bakes that we can try, please do leave your suggestions below.